Project obstacles and solutions: The Green Plains Ethanol Plant in Bluffton, Indiana ships ethanol to market via rail tanker cars. In order to safely transport the ethanol, buffer cars are put in between the engine and the tankers. This serves to distance the raw ethanol from the heat and possible ignition source of the locomotive. They also use loaded buffer cars as ballast weight to evenly distribute the load and protect jarring the car couplings on the ethanol cars. 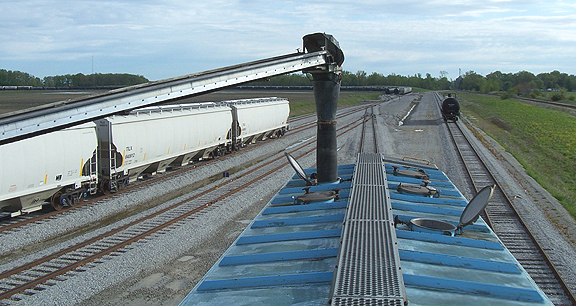 Green Plains Ethanol had a need for aggregates to fill the buffer cars in order to get the desired ballasting weight. The problem was the openings on top of the buffer cars were small ovals approximately two feet in diameter. Green Plains had just begun operations and had its first shipment of 100 ethanol cars ready to leave their facility. They had no way of getting the cars loaded. The IMI Bluffton Aggregates plant came up with a solution. They contacted R.L. McCoy, Inc. who had a Telebelt lifter. This machine is a self-contained conveying system with an on board loading hopper. It has a reach of 120 feet on a radius from the base of the unit. IMI also contacted Jerry W. Bailey Trucking, who supplied tri-axle dump trucks with coal doors in the tailgates of the trucks. This made short work of a difficult material placement job. Green Plains Ethanol was able to move the ethanol cars two days earlier than expected.